DearMob iPhone Manager for Windows FAQs, Troubleshootings. Technical FAQs User Guide Still in Doubt? 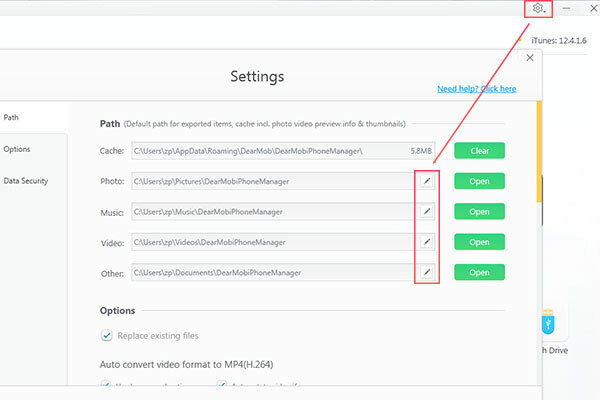 Why can't I click "Add Photo" or "Delete Photo" on DearMob iPhone Manager? 1. Create a new album first by click "＋" icon. 2. Then click "Add Photo" or "Add Folder" to import new photos. 3. Hit "Sync" button to transfer the files to your iPhone iPad. Also, you can delete the photo in the album that you created. Please Note: Photos can't be added to a locked album. Please add photo to an unlocked album. And photos in locked album can't be deleted. Can't add video to iPhone, how can I add video to iPhone? Videos can't be added to locked list like "Video Recorded", please select another list to add. You can find the steps of adding video to iPhone. DearMob iPhone Manager can't recognize my iPod Classic? DearMob iPhone Manager supports iDevice with iOS 7 and later. Unfortunately, iPod Classic cannot be upgrade to iOS 7. Why can't I connect my iPhone to DearMob iPhone Manager? ● Please download the latest version of DearMob iPhone Manager. ● Make sure your device is iOS 7 and later, if not, please upgrade the OS. ● There may be USB cable connection problem. Please reconnect your iPhone to computer, or change to another USB port, or change USB cable. ● Make sure you "Trust This Computer". Where to find the backup files of iPhone? ● If you want to find the file to store photo, music, video or other backup file, please go "Settings" on DearMob iPhone Manager. I can't run DearMob iPhone Manager on Windows XP, why? DearMob iPhone Manager is not compatible with Windows XP. It is compatible with Windows 10/8.1/8/Vista/7. Why can't I see the Close(x), Register and Sync button? The lowest resolution of Windows screen that DearMob iPhone Manager supports is 1280*960. If you set your computer's resolution lower than 1280*960, the interface will be enlarged too. You can drag the interface of DearMob iPhone Manager to find the Close and Register button. To avoid the issue and view the Sync button, please set the resolution of your computer higher than 1280*960. If you run a Windows 10 system, you can change the display scaling to 100%. How to change the backup path? ● To change the separated backup path like photo, video, music, please go Settings. Click the pencil icon to customize the default destination folder. ● To change the whole backup path, please follow below steps. 1. Go to the original backup path C:\Users\*USER NAME*\AppData\Roaming\Apple Computer\MobileSync, and move(Cut and Paste) the MobileSync folder to where you want it to store, for example: D:\Apple\MobileSync. 2. Find CMD in the computer search and launch the Commander program. Input mklink /j "C:\Users\zp\AppData\Roaming\Apple Computer\MobileSync" D:\Apple\MobileSync, and press Enter. 3. After the junction created, you can see there's a shortcut of MobileSync folder in the previous backup path. Then you can try new backup now. The data will be stored on D Drive instead of C Drive. Please Note: We highly suggest you not to change the whole backup path if you are very unprofessional in your computer. Why do I need to input password when export SMS from iPhone? If there is a password needed to export SMS, that's because you've set a password when backup the whole data of your iPhone to computer, whether through DearMob iPhone Manager or iTunes. Please remember the password for backup. If lost, there is no way to retrieve it. Why can't I open DearMob iPhone Manager any more after a force quit? If you closed DearMob iPhone Manager by Task Manager (Applications), you may did not close the program completely. 1. Go Task Manager, and select "Processes". 2. 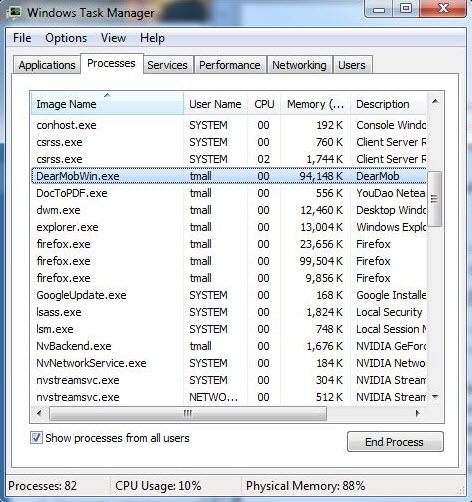 Find "DearMobWin.exe", then click "End Process". 3. Now you can open DearMob iPhone Manager again. Why can't I restore my iPhone backuped file? Please close the option of "Find Your iPhone" in the Settings, also higher version iOS's backup cannot be restored to the lower one. What to do when you forget the password for the encrypted full backup? 1. On iPhone/iPad, go to Settings > General > Reset. 2. Tap Reset All Settings and enter device passcode. 3. Follow the steps to reset your settings. This won't affect your user data or passwords, but it will reset settings like display brightness, Home screen layout, and wallpaper. It also removes your encrypted backup password. Then you can make new backup on DearMob iPhone Manager with or without encryption. Can’t find what you are looking for? Let us help.